At least 11 Palestinians have been killed and more than 1,100 injured in a crackdown on Palestinian Land Day, 30 March, an annual day of resistance against Israeli occuptation and the settler-colonial project. According to a statement released by the Israeli army, 17,000 Palestinians are protesting at five different locations along the border-fence between Gaza and Israel - human rights organisations say the number is closer to 30,000. HRDs in Gaza report that in additional to live ammunition and tear gas, Israel has fired tank shells at peaceful protestors. "The military's claim that it was 'firing towards the main instigators' is a stark admission, and a continuation of the systematic targeting of human rights defenders and protest leaders - people peacefully defending freedoms of association, assembly, expression and self-determination," said Adam Shapiro, Head of Communications and Visibility at Front Line Defenders. "The deliberate and premeditated shooting of Palestinian activists in Gaza, demonstrating for rights guaranteed under international law, is a crime." The violent expropriation of Palestinian land is a guiding pillar of the Israeli state, and has been continuous since its founding. This year, Palestinian HRDs organized 45 days of resistance to mark 70 years since the 1948 Nakba ("the catastrophe") in which more than 700,000 Palestinians were violently forced from their homes during a bloody Israeli assault on hundreds of villages. In 1976, six unarmed Palestinian citizens of Israel were killed by Israeli forces during protests against land theft. Every 30 March since, HRDs and their communities commemorate these killings with Palestanian Land Day, demanding an end to decades of violence that scattered their people across continents and left as refugees more than 70 percent of Gaza residents. Ahead of the violence beginning on Friday morning, Palestinian HRDs reported widespread defamation campaigns against activists who organised local demonstrations, the shutting down of independent Palestinian media outlets, and HRDs' social media accounts being shut down by Facebook and Twitter. The military has led an extensive smear campaign aiming to paint the Great Return March as Hamas-led, when in fact it is a collaboration between civil society organisations, HRDs, independent activists, labourers, teachers, students, and families. Ahead of the march, HRDs reported fears that as a result of the smear campaign labeling it a violent Hamas event, Israel would react with even more lethal force and be met with international silence. The fears were well founded. Ahead of the protests, Israel deployed 100 additional special forces snipers and several infantry brigades to the border region. Military generals told Israel’s security cabinet in advance that there would be Palestinian casualities. Meanwhile, Israel's billion-dollar PR-machine went into overdrive, launching a series of infographics that predetermined the march to be violent and led by Hamas. The dark irony of the campaign is two-fold. First, Israel has never waited for a resistance movement to employ violence – real or imagined – to respond with lethal force. Weekly, soldiers fire live rounds, tear gas, rubber-coated steel bullets and concussion grenades at peaceful protesters across Palestine. HRDs are routinely shot, attacked, detained and tortured. In October, Israeli forces shot HRD Imad Abu Shamsiyya with four tear gas canisters at a peaceful pray-in in the south of Hebron. He survived, and in March an Israeli settler attempted to run him over. The military needn't waste its money convincing people that the Land Day protests were violent. Anyone who's been paying attention already knows: lethal assaults on civilians and HRDs are not motivated by violent protests, they are endemic to the Israeli state. Second, the notion that millions of people living an open-air prison need Hamas to incite them is absurd. Resistance to the military occupation of Palestine has been continuous for decades, despite the violent, often deadly, assault on human rights defenders who lead it. 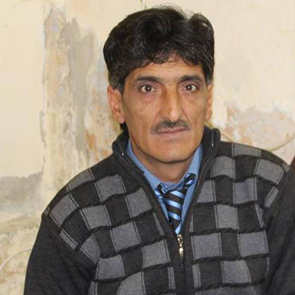 One of those killed today was Mohammad Abu Amro, a well-known artist in the Gaza Strip. Yesterday, he sculpted the Great Return March's hashtag onto a beach in Gaza, a massive sand installation reading simply, "I’m returning." Today, he was gunned down by an Israeli sniper while peacefully marching to the border-fence. As HRDs in Gaza continue to lead, organise, document, march and resist, we cannot allow their struggle to painted as anything other than what it is: an absolute, unrelenting, and unapologetic demand for an end to Israel's bloody occupation of their land. For the 70th straight year, Palestinians have met fire with flags.